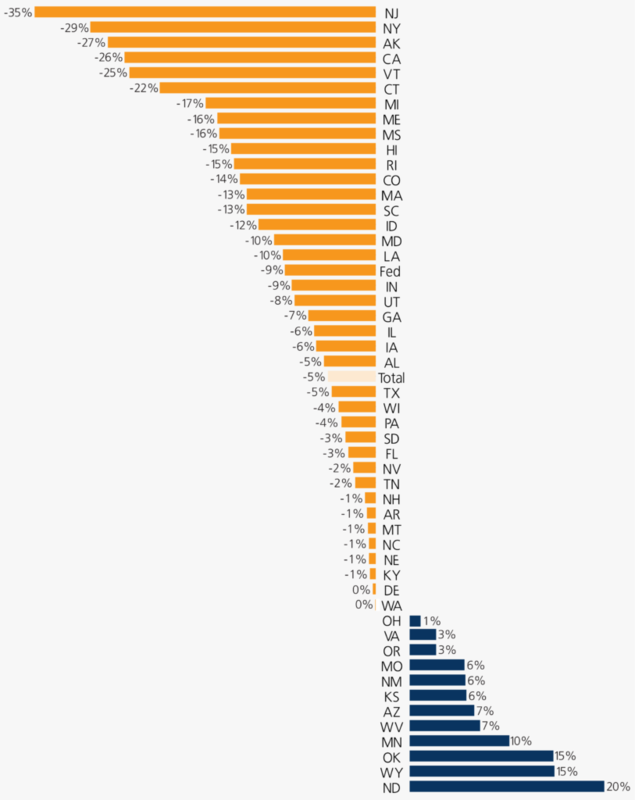 While the majority of states have at least modestly reduced their prison populations in recent years, 16 states have achieved double-digit rates of decline and the federal system has downsized at almost twice the national rate. While states and the federal government have modestly reduced their prison populations in recent years, incarceration trends continue to vary significantly across jurisdictions. Overall, the number of people held in state and federal prisons has declined by 4.9% since reaching its peak in 2009. Sixteen states have achieved double-digit rates of decline and the federal system has downsized at almost twice the national rate. But while 38 states have reduced their prison populations, in most states this change has been relatively modest. In addition, 12 states have continued to expand their prison populations even though most have shared in the nationwide crime drop. Southern states including Mississippi, South Carolina, and Louisiana, which have exceptionally high rates of incarceration, have also begun to significantly downsize their prison populations. These reductions have come about through a mix of changes in policy and practice designed to reduce admissions to prison and lengths of stay. Moreover, the states with the most substantial prison population reductions have often outpaced the nationwide crime drop. The pace of decarceration has been very modest in most states, especially given that nationwide violent and property crime rates have fallen by half since 1991. Despite often sharing in these crime trends, 15 states had less than a 5% prison population decline since their peak year. Moreover, 12 states have continued to expand their prison populations, with four producing double-digit increases since 2010: North Dakota, Wyoming, Oklahoma, and Minnesota. Just as mass incarceration has developed primarily as a result of changes in policy, not crime rates, so too have declines reflected changes in both policy and practice. These have included such measures as drug sentencing reforms, reduced admissions to prison for technical parole violations, and diversion options for persons convicted of lower-level property and drug crimes. Source: Prisoners Series (1999-2015), Bureau of Justice Statistics. Note: Idaho and Illinois data may not be fully comparable across years.